SPLIT FACADES is a photographic project that explores the duality of experience and physical interaction that is manifested in the continuously changing landscape of Johannesburg city. The project aims to interrogate how the continuing push toward a globally marketable, gentrified ‘African’ city that has taken place over the past few years, ultimately fails to consider the informal but longstanding identity and ingenious culture of Johannesburg’s current inhabitants as one that is tied to the physical landscape of the city itself. The exhibition, curated by Thato Mogotsi, will feature a series of black and white prints by Kutlwano Moagi, alongside audio and video installations. These works will suggest a new understanding of the city’s landscape as one that ought to consider the different planes of consciousness and unconsciousness which inhabitants experience when moving through the city. Please join us for the opening reception on Thursday, 2 February at 18.30, GoetheonMain, Arts on Main. KUTLWANO MOAGI is an independent photographer. Born in Soweto, Johannesburg, 14 April 1983. He completed a photography learnership programme at the Market Photo Workshop in 2005 and has since participated in numerous group exhibitions locally and internationally. Among these is the Reportage Atri Festival in Italy. 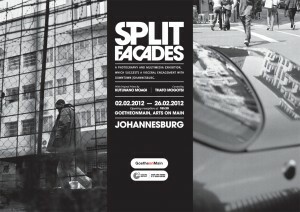 Split Facades is his first solo exhibition. THATO MOGOTSI is an independent curator and writer with a special focus on documentary photography. She received training in Photojournalism and Documentary Photography from the Market Photo Workshop in 2006 and later went on to join the daily newspaper, The Times, as assistant photo editor and online picture researcher. Recently, she was project assistant and co-curator on several critical projects including the Wide Angle Forum on Participatory Photography Practice and the 2011 FNB Joburg Art Fair, among others. Split Facades is her first independent curatorial project.